Our 2,000-mile-diameter Moon has been orbiting Earth for over 4 billion years. Its much smaller cousins, dubbed “minimoons,” are thought to be only a few feet across and to usually orbit our planet for less than a year before resuming their previous lives as asteroids orbiting the Sun. Mikael Granvik (formerly at UH Manoa and now at Helsinki), Jeremie Vaubaillon (Paris Observatory) and Robert Jedicke (UH Manoa) calculated the probability that at any given time Earth has more than one moon. They used a supercomputer to simulate the passage of 10 million asteroids past Earth. They then tracked the trajectories of the 18,000 objects that were captured by Earth’s gravity. They concluded that at any given time there should be at least one asteroid with a diameter of at least one meter orbiting Earth. Of course, there may also be many smaller objects orbiting Earth, too. According to the simulation, most asteroids that are captured by Earth’s gravity would not orbit Earth in neat circles. Instead, they would follow complicated, twisting paths. This is because a minimoon would not be tightly held by Earth’s gravity, so it would be tugged into a crazy path by the combined gravity of Earth, the Moon and the Sun. A minimoon would remain captured by Earth until one of those tugs breaks the pull of Earth’s gravity, and the Sun once again takes control of the object’s trajectory. 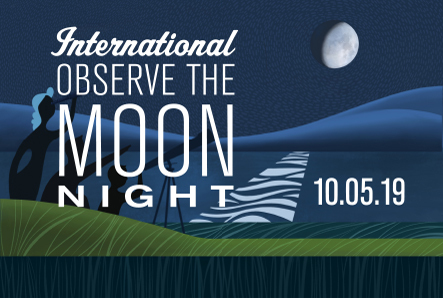 While the typical minimoon would orbit Earth for about nine months, some of them could orbit our planet for decades. Earth captures a minimoon. The path of a simulated minimoon that is temporarily captured by Earth. The object approaches Earth from the right along the yellow line and continues on its trajectory along the orange path and finally escapes capture along the red path to the upper right. The size of Earth and the Moon are not to scale but the size of the minimoon’s path is to scale in the Earth-Moon system. Inset: Radar image of near-Earth asteroid 1999 JM8 made with NASA’s Goldstone Solar System Radar in California and the Arecibo Observatory in Puerto Rico by a team of astronomers led by Dr. Lance Benner of NASA’s Jet Propulsion Laboratory in Pasadena, California. 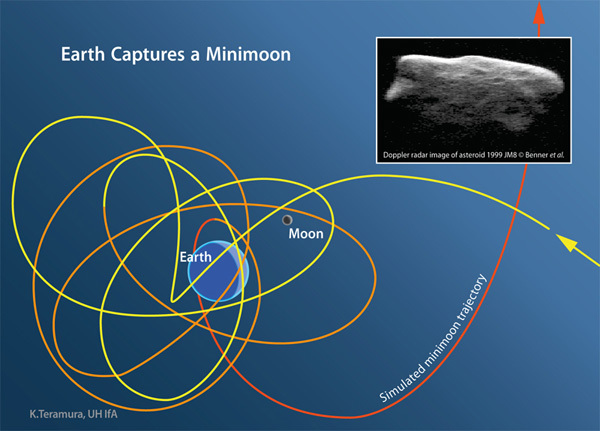 Minimoons are captured from the much larger population of near-Earth asteroids that pass close to Earth. This two-mile-diameter asteroid is more than a thousand times larger than the biggest minimoons, but it shows the irregular shape and pockmarked surface expected on the much smaller minimoons. In 2006, the University of Arizona’s Catalina Sky Survey discovered a minimoon about the size of a car. Known by the unimaginative designation 2006 RH120, it orbited Earth for less than a year after its discovery, then resumed orbiting the Sun. The team’s paper, “The population of natural Earth satellites,” appears in the March issue of the journal Icarus. The team used the Jade supercomputer at the National Computer Center for Higher Education (Centre Informatique National de l’Enseignement Supérieur, or CINES) at Montpelier, France. This work was supported in part by the National Aeronautics and Space Administration under Grant No. NNX08AR22G issued through the Planetary Science Division of the NASA Science Mission Directorate. 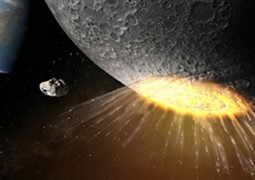 The Chicxulub crater likely looked like the Schrödinger basin on the Moon.